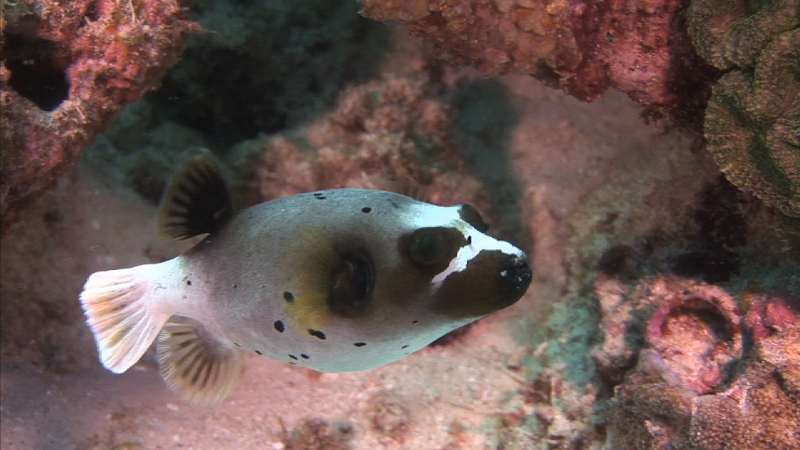 This is a Blackspotted puffer fish. It can be found in the Pacific Ocean and Indian Ocean. It has four teeth fused together that look like a beak. This fish is poisonous, so it’s not safe to eat. To scare away predators, it puffs its body up like a balloon. That’s how it got its name. I think we can all agree – that is one weird animal! Este es el pez globo de puntos negros. Se puede encontrar en el Océano Pacífico y el Océano Índico. Tiene cuatro dientes fusionados que se asemejan a un pico. Este pez es venenoso, por lo que no es seguro para comer. Para ahuyentar a sus depredadores, hincha su cuerpo como un globo. Así es como obtuvo su nombre.